How many houses will there be in Throsby? At full development Throsby will accommodate approximately 1,000 dwellings, the majority of which will be on single residential blocks. Throsby will include a range block types including detached homes, townhouses and apartments. Single residential blocks will average 500m2. 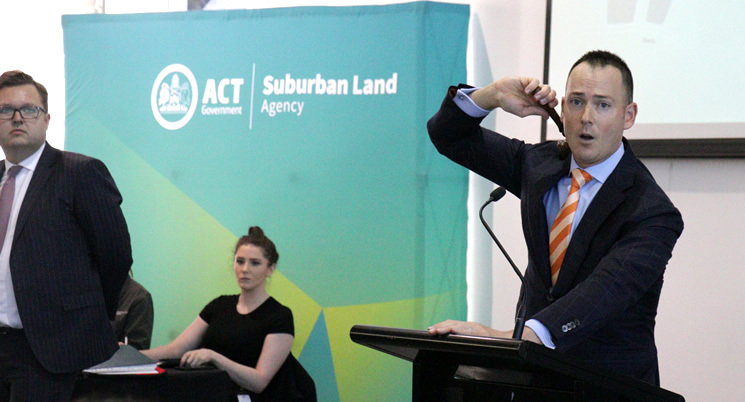 Land in Throsby will be released through a combination of auctions, ballots and tenders. Will there be schools and shops in Throsby? A small mixed use development site is planned. The nearby Franklin and Harrison schools will service the population of Throsby. Civil construction works are generally completed within a 12 to 18 month period from when the tender is awarded. Construction of Stages 1, 2A and 2B are now complete. Can the road network cope with the increased traffic from Throsby? Yes. Traffic studies were undertaken prior to any development in East Gungahlin and a range of traffic and transport recommendations have been completed to ensure the road network can cater to the expected development in the district. As part of the development of Throsby, access roads are proposed via three intersections along Horse Park Drive including Anthony Rolfe Avenue, Mapleton Avenue and Well Station Drive. For more information, please visit the Horse Park Drive Upgrades webpage. Retention of mature trees as much as possible and planting of additional trees to establish an understorey to enhance and strengthen the foraging corridors for the endangered Superb Parrot, which nests in the adjacent nature reserve. Utilising Gungaderra Creek to form a central open space link from the suburbs of Franklin and Harrison to Mulligans Flat and Goorooyaroo Nature Reserves. Within this space a site will be reserved for a future Visitors Centre as part of the expanded Nature Reserve system. Landscaping will be sympathetic with the ecological values of the area and residents will be encouraged to landscape with a range of plants offering foraging opportunities for the Superb Parrot. Access to the nature reserves will be managed to minimise impact on Superb Parrot nesting areas. Will there be public housing in Throsby? The ACT Government has confirmed that it will be developing public housing in Throsby. The percentage of public housing in Throsby will be approximately six per cent which is consistent with the ACT Government approach to providing public housing across all of Canberra. Has any previous consultation been done for Throsby? A presentation regarding the draft Estate Design for Throsby was made at the Gungahlin Community Council (GCC) meeting on 14 May 2014. Drop-in information sessions were held on 15 and 17 May 2014 at the Gungahlin Library to provide an opportunity for the public to view the draft design. The EDP was publicly exhibited as a part of the Development Application process. A presentation providing an update on progress and outlining the construction program was made at the Gungahlin Community Council (GCC) meeting on 12 August 2015. Regular contact will continue to be maintained with key stakeholder groups including the GCC.